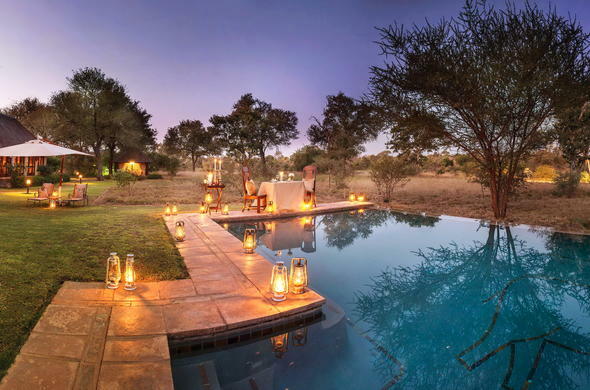 This safari lodge in Africa enjoys complete peace and tranquility, surrounded by an unspoilt and untouched wilderness. This African safari lodge is situated in the Timbavati Private Nature Reserve and forms part of the greater Kruger National Park. King's Camp is excellent for game viewing, and Elephant, Lion, Leopard, Rhino and Buffalo can be seen regularly roaming the plains. This Africa lodge enjoys complete peace and tranquility, surrounded by an unspoilt and untouched wilderness. Accommodation at this safari lodge in Africa is in 10 thatched suites for a maximum of 20 guests. These suites boast indoor and outdoor showers, air conditioners, mosquito nets and a self service bar facility. This Africa lodging is the ideal retreat from the stresses of modern living and invites you to come and experience pure peace, beauty and relaxation in the African bushveld.